How to find a job by building relationships. Continuing our series of articles on networking and how it can help you get that job! You will find you need to take your time, so slow down and enjoy this time. Good and effective networking is something you shouldn’t rush. This doesn’t mean you shouldn’t be efficient, just not hurried. Rushed networking won’t help build relationships, so, slow it down a bit and enjoy the whole process. Taking your time will actually *speed up* your chances for success in the job hunting race, just because you have an *agenda* doesn’t mean you still can’t enjoy yourself. Don’t be one of those networkers who get what they want and then disappear never to be heard of again until the next time they need something. Invest in your network – follow up and provide feedback to all of those who were kind enough to lend a hand. Thank them for their assistance or referral; let them know if you scored an interview or if you got the job. You can always use the opportunity to report on a lack of success to ask for some help again. *Are those networks in you connection strong? *Does your network both challenge and support you? *Do you trust your network to give you the real truth about yourself? *Is your network vibrant and dynamic? *Do your networks represent your past? Or your future goals? Give yourself 1 point for each YES – if you get 5 points then your network is fine. 3-4 points you may need to enhance parts of your network and 0-2 points – you need to start your network over again. Tip #5 – Take advantage of both your strong and *weak* ties. Everyone has strong and weak ties, the strong are usually your inner circle, while the *weak* are those ties not quite so established. Adding people to your network is time consuming, so trying to stay in contact with new acquaintances can be quite challenging. Consider adding *weak* ties to your network – they add to your network and can bring vitality, new networks, opportunities and viewpoints. So how can you strengthen your job network? *Tap into those ties that are strong. Strong ties will lead you to weak ties that in turn build a stronger network. Use your existing members to both reconnect with people and to add new people. *Think about where it is that you want to go. 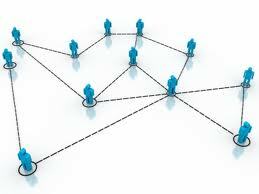 Your network should reflect not only where you have been, but, where you are going. Add those who reflect your area of interest, jobs, industries and issues. Read journals, attend conferences and keep up with advancements or news in your chosen field so you know where you want to go. *Make connecting a priority. Make networking a part of your lifestyle, it breathes new life into you and helps give you confidence. As you connect with new people the world will feel a lot smaller, and, a smaller world is a LOT easier to manage. Do you have anything to add? Has networking helped? How have you used networking in the past? Perhaps now you’ll give it try? Feel free to share your experience with us, we’d love to hear!